Skrill has been moving money digitally since 2001, offering online payment solutions for businesses and consumers that allow them to make transactions globally. The product's fast-paced growth required exeptional talent. Adding new talent to the core tech team. Building and implementing new features quickly. Maintaining and expanding a big code base. Netguru joined forces with Skrill's team, based in Berlin. During the development process, both companies met face-to-face in their offices. Implementing and presenting user workflows with the pre-existing API services. Implementing part of Netguru's flow to Skrill's development process. Stable and consistent development of key modules. Customers can choose from 100 payment options to securely send and receive money in 200 countries. 40 currencies are available, the transaction cost is low, and users' financial details are not at risk. 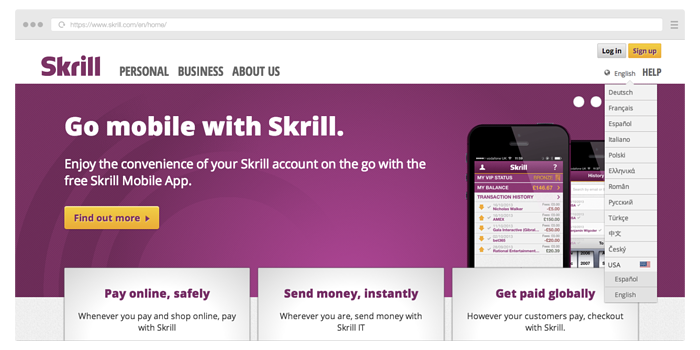 A key module: account.skrill.com - an app for payment account management. Regular implementation of new features and consistent bugfix releases to both the App Store and Google Play. An integral part of the new Skrill website.